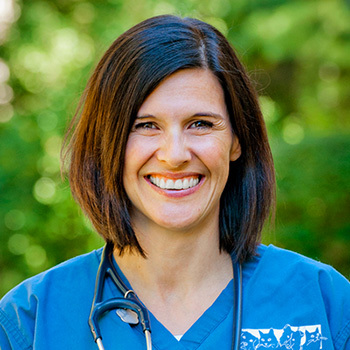 Dr. Alexandra Pfaff is originally from Germany and received her veterinary degree from the Ludwig Maximilian University in Munich in 2010. Following graduation, Dr. Pfaff completed a one-year small animal rotating internship at Tufts VETS and spent time back in Germany working at a large referral hospital in Munich. In 2012 she returned to the Cummings School of Veterinary Medicine at Tufts University for a three-year residency in Emergency and Critical Care. Dr. Pfaff became a Diplomate of the American College of Veterinary Emergency and Critical Care in 2015. Her work has been published in the Journal of Small Animal practice and she received a research poster award at the International Veterinary Emergency and Critical Care Symposium in 2014. Her professional interests include sepsis, coagulation, trauma, management of postoperative patients, toxicities and transfusion medicine. During her free time, she enjoys hiking, running, skiing, Yoga, travelling and spending time with her husband and her two cats Salma and Heidi.